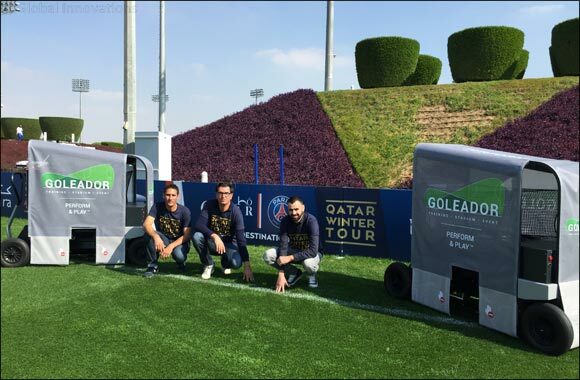 Doha, Qatar, March 2, 2016: SDDS Corporation introduced its GOLEADOR Training™ football launchers for the first time in the Middle East in the run up to the recent friendly between Paris Saint Germain and Inter Milan in Qatar on December 29, 2015. Before the match, a number of the innovative GOLEADOR Training™ launchers were demonstrated to H.E. the French Ambassador in Qatar, Mr. Eric Chevallier, as well as to the Paris Saint Germain team who had the exclusive opportunity to train using them during their Qatar Winter Tour 2015™. During the team’s winter training camp and visit to Qatar, PSG Coach Laurent Blanc spent some time testing the launchers with his players, putting the product through its paces. He gave a positive assessment of using the automated ball launchers during his team’s training sessions, particularly for goal keeper drills including catching, crosses, and diving and working on strikers’ finishing. Aspire Academy – founded in 2004 with the goal of finding and developing the best young male Qatari athletes, whilst also providing them with high quality secondary school education – has incorporated GOLEADOR Training™ football launchers into some of its training sessions, featuring them in a number of exercises. They will also be made available to other major European football teams during their visits to Qatar for training camps. SDDS Corporation is the sole producer and exclusive distributor of GOLEADOR Training™ in the world. SDDS Corp works with soccer clubs, federations, sponsors and industry professionals: agencies, sports marketing, rights and communication management agencies looking to develop innovative training methods.